Almost every college has a writing center. Writing centers help all students, including freshmen who are overwhelmed with an assignment and graduate students writing a dissertation. The college writing center is where students can ask writing questions, have a paper reviewed, or recieve composition help from faculty and peers. Many writing centers also host seminars, conferences, and interviews with published authors. Some students only use the writing center for difficult assignments, while others get regular tutoring in grammar, support in composition, or assistance with a second language. While most college students have access to a writing center, those who attend the listed schools below can enjoy some of the best collegiate writing programs in the country. Many writing centers offer special benefits, including writing lab space, assistance with multilingual writing assignments, and group tutorials on creative writing and composition. Some of these centers focus on technical or scientific writing, while others emphasize creative composition. All the writing centers listed below provide tutoring and support for their students, and are collaborative, innovative, rigorous, and thriving centers of literary potential. Located just outside of Boston, Massachusetts, Harvard is the oldest institution of higher learning in the U.S. The college's programs are ranked as some of the world's finest. Since the school is well-known for both science and the humanities, Harvard's writing center draws faculty and peer tutors with technical and creative backgrounds. Students can take advantage of English grammar and senior thesis tutors. Additionally, the Bok Writing Fellows program gives students access to discipline-specific writing tutors. Students can schedule two appointments a week; drop-ins are also welcome. With instructor permission, students can bring in take-home exams to the writing center. The writing program also publishes Exposé Magazine, which features a cross section of the finest writing by Harvard students. Located in New Haven, Connecticut, Yale is a top-ranked Ivy League institution that serves as the academic home of more than 12,000 graduate and undergraduate students. Yale counts five former U.S. presidents, 19 supreme court justices, and 20 living billionaires among its graduates. The Yale Center for Teaching and Learning houses the university's writing center. The center offers undergraduate writing assistance, a graduate writing lab, and a multilingual writing resource. Students who visit the center, or the website, can view model papers, review writing handouts, and find resources for creative writers and ESL writers. The graduate writing lab offers peer review groups and seminars on academic writing. Graduate students can schedule consultations for dissertations or research project assistance. There is even a writing program for law students. Yale's multilingual writers can download English grammar tutorials from the writing center's website. Northwestern University is a private, nonsectarian research university with a main campus in Evanston, Illinois, just outside Chicago. Almost 13,000 of the school's more than 21,000 students are pursuing graduate degrees. Northwestern commonly ranks among the top 20 colleges in the U.S. The university's writing center is known as The Writing Place and offers peer-to-peer tutoring for student work. Students can make appointments at one of The Writing Place's three locations -- the main campus in Evanston, the graduate writing place, and the Chicago campus. Students can also access The Writing Place through online portals. Writing services include individual writing consultations, graduate writing workshops, interdisciplinary writing groups, and dissertation boot camps. The Writing Place offers the Freshman Seminar Writing Awards and the Graduate Writing Assistantships. Students are limited to two one-hour appointments per week. Established in 1774 in Upper Manhattan, New York City, Columbia University is a private, Ivy League school and the largest higher education institution in New York state. Columbia boasts an impressive roster of alumni, including five founding fathers, 95 Nobel laureates, and 38 living billionaires. Almost 20,000 of the university's nearly 28,000 students are pursuing graduate degrees. Columbia's writing center provides one-on-one tutoring and workshops for graduate and undergraduate students at every stage of writing, from brainstorming to the final draft. Each one-on-one consultation is a 45-minute collaboration that focuses on writer's long-term development. Students can come once per day or twice per week. ESL students can receive an exemption from these limitations. The writing center is open Monday through Friday, and on Sunday by appointment. The flagship institution of the University of Texas system, the University of Texas at Austin is a public research university with more than 50,000 graduate and undergraduate students. UT Austin is a space-grant university. The school offers 100 undergraduate and 170 graduate degrees. The University Writing Center is housed under the the department of rhetoric and writing. The center provides one-on-one consultations, retreats, writing groups, and online resources for writers. Students can also listen to the writing center's podcast, How We Write, and take advantage of Praxis, the university's peer-reviewed journal on the intersection of practice and theory in writing. Students can make an online appointment once per day or twice per assignment. Massachusetts Institute of Technology is a private land-grant and space-grant institution in Cambridge, Massachusetts. The university educates more than 12,000 graduate and undergraduate students, primarily in applied science and engineering. MIT enjoys a consistently high rank among the world's most prestigious universities. Boasting more than 120,000 alumni, MIT has Nobel prize winners, founders of major corporations, college presidents, and leaders in global economics among its graduates. Communication experts staff the MIT Writing and Communication Center, and services are available to all members of the MIT community. Employees are trained to help students discover new content, analyze the conventions of writing, develop writing style, and practice presentations. Staff are not primarily proofreaders; instead, they are teachers who can help writers overcome writer's block, revise their work, and understand the intricacies of English grammar. MIT offers special writing assistance to ESL students. Located in Providence, Rhode Island, Brown is a private, Ivy League school, and the seventh oldest U.S. higher education institution. Brown boasts an enrollment of more than 9,000 students and nearly 6,000 undergraduates. The university is home to a prestigious and award-winning faculty, including Nobel laureates and Pulitzer Prize winners. Brown's alumni includes many notable authors. The school's writing center focuses on one of the university's goals: that Brown graduates should write well. Staff at the writing center assist students with composition at every level, from selecting a topic to a final read through. Composed of experienced teachers and writers, the writing center's staff includes professional tutors, graduate students, and experienced undergraduate writing fellows. ESL specialists are also available to help multilingual writers. Appointments at the center last 50 minutes and focus on a single project. Students must limit their visits to one appointment per day and no more than two per week. A private, nonprofit, and research-intensive school located in Manhattan, New York, The New School began in 1919 as a home for progressive thinkers. Today, it is the academic choice of more than 10,000 students from undergrads to doctoral scholars. The New School's writing center is part of the University Learning Center, which offers writing tutoring, workshops, and ESL services. Writers can make an appointment with writing center staff for help with brainstorming, drafting, editing, or polishing their work. Students pursuing a master's or doctorate can access graduate-level assistance for research papers and dissertations. Students schedule up to two tutoring sessions at a time, and the center welcomes walk-ins. Normal sessions are one hour long, but students with complex projects may request a two-hour session. ESL students can join pronunciation and conversation groups. From its campus in Colorado Springs near the foot of the high Rocky Mountains, Colorado College educates a little more than 2,000 undergraduate students through 42 majors and 33 minors. The school is extremely selective, accepting only 15% of applicants and consistently ranking as one of the best liberal arts colleges in the country. The innovative institution provides a low student-to-faculty ratio of 10:1. At Colorado College, the writing center is part of the Colket Center. Peer consultants help students with essays, research papers, cover letters, scholarship applications, and resumes. Writing center staff help with brainstorming, researching, organizing, and editing. Professional staff at the center include a humanities librarian and a cultural and linguistic diversity education specialist. Tutors are available Sunday through Friday and can work with students in person or online. Located in Pittsburgh, Pennsylvania, Chatham University is a private women's college with a little more than 2,000 students; some programs are also open to men. Chatham has received numerous accolades for its academic excellence. The university's writing center falls under the purview of the PACE Center, a support system designed to meet the academic needs of the student body. Staff at the writing center provide assistance at all stages of the writing process, including determining a topic, making revisions, understanding instructor feedback, and avoiding plagiarism. Since the writing center is not a proofreading service, it maintains a list of fee-based, external editors who can assist doctoral students with research articles and dissertations. The writing center also oversees the First-Year Writing Program Diagnostic Exam and a one-credit course called foundations of effective writing. Consistently ranked among the nation's finest liberal arts colleges and noted for its high level of Fulbright scholarship recipients, Ithaca College educates about 7,000 students, mostly undergraduates, at its campus in Ithaca, New York. The school is private, non-sectarian, and committed to the values of multiculturalism. Ithaca's writing center falls under the direction of the School of Humanities and Sciences. The writing center's peer tutors and trained faculty assist scholars at all levels to improve the clarity and focus of their writing. The center accepts appointments every day except Saturday and requires that students bring a draft of their piece, the assignment sheet, and any relevant research. Each session is one hour. Appointments are not proofreading sessions, but rather coaching opportunities where the tutor assists the student with strategies and skills to become a stronger, academic writer. Jaime Warburton, director of the renowned Ithaca Writers Institute, leads the writing center. Located in Sewanee, Tennessee and owned by 28 dioceses of the Episcopal Church, the University of the South is home to about 1,800 undergraduate and graduate students. The university is acclaimed for its writing-related programs, including its master's degree in English and its MFA in creative writing. Publications at the school include the prestigious Sewanee Review, a literary magazine established in 1892. The university hosts the Sewanee Writers Conference each summer. The Sewanee Writing Center, located in the university's library, is open Sunday through Thursday. Students can schedule appointments online, but walk-ins are also welcome. In addition to an impressive library of handouts and writing resources, the writing center also provides assistance to faculty in the form of writing handbooks and discipline-specific guides. Dr. Stephanie L. Batkie, the former head of the graduate program in English at the University of Montevallo, leads the writing center team. A private, liberal arts institution in central Pennsylvania, Susquehanna University educates more than 2,200 students on a rural, 325-acre campus. Susquehanna has a 12:1 student-to-faculty ratio and 100 academic programs. The school is great for students looking for a highly personal institution with a strong academic focus. Susquehanna is also home to the Writers Institute, which sponsors four literary magazines, six guest speakers annually, and a forum for student editors. The university's writing center is part of its larger Center for Academic Achievement, a resource described as an "educational gym" that builds stronger students. The writing center is open Sundays through Fridays and welcomes students who want to improve their writing and critical thinking skills in any subject. While walk-ins are welcome, the center recommends appointments. A session at the writing center may last 30 minutes for a smaller assignment or an hour for a larger one. Located in Clinton, New York, Hamilton College is an exclusive undergraduate institution with a little more than 1,800 students. Hamilton is a private college and the third-oldest higher education institution in the state of New York. Until 1978, Hamilton was an all-male institution, but today, its student body is 51% female. The school's extremely selective admissions policy has contributed to its regular placement on "best of" lists for liberal arts colleges. The writing center at Hamilton College offers individual writing conferences and larger workshops to students. Peer tutoring is at the heart of the center's philosophy, and the center offers one-on-one conferences with tutors. Students can also take advantage of the on-site computer lab. Faculty members may access the writing center for help with special writing assignments and curriculum planning. The writing center is open every day but Saturday, and students can make appointments by phone. First established in 1798, the University of Louisville now educates more than 22,000 students each year. The university was the first of its kind to be a subsidiary of a city, and today, it is part of the university system of Kentucky. As a major research university, UofL attracts students from Kentucky, all 50 states, and 116 countries around the world. UofL students study on three campuses in the Louisville area: one in Panama and several satellites around the state. The University of Louisville Writing Center supports writers across the university community with tutoring and coaching in every stage of the writing process. The center offers programs to graduate students working on dissertations, distance education students, creative writers, and LGBTQIA+ writers. Students can use the writing center in person or online and may make three face-to-face appointments or one virtual appointment per week. Bronwyn Williams, author of the book Literacy Practices and Perceptions of Agency: Composing Identities, serves as director of the writing center. Located in Madison, the University of Wisconsin is a land-grant and sea-grant public university that serves as the flagship for the state's university system. Almost 45,000 students pursue degrees in one of the 136 undergraduate majors, 148 master's programs, or 120 doctorates. UW is often considered a Public Ivy, that is, a public school with a ranking and reputation similar to the Ivy League. UW's writing center offers online and onsite assistance to undergraduate and graduate writers at any stage in the writing process. Students can make an appointment for individual assistance with writing, attend one of many free writing workshops, or download a writer's handbook. Faculty can also access a variety of resources at the center, including writing advice, samples, and handouts. The writing center's resources are available to students at satellite campuses, and students can even receive instruction through Skype or email. Affiliated with the Presbyterian Church (U.S.A.) and located on a historic campus near Davidson, North Carolina, Davidson College is a liberal arts institution with about 2,000 undergraduate students, 85% of whom were in the top 10% of their high school classes. Learners are from 47 states and 40 countries and can pursue 26 majors and 17 minors. Davidson was an all-male college until 1972 when it first admitted women. In 2007, Davidson gained recognition as the first liberal arts college to eliminate the need for students to take out loans to fund their education. Part of the Center for Teaching and Learning, Davidson's writing center staffs peer tutors who can assist students with forming argumentation and analyses at any point in the writing process. Students can make an appointment with peer tutors in their subject area online. The writing center is open Sunday through Thursday and is located in the library building. Situated on 1,880 acres in Iowa City, the University of Iowa is a public, space-grant institution that serves as the flagship for the state's university system. UI educates more than 33,000 graduate and undergraduate students and has more than 250,000 alumni. The institution was the first public university to open with both male and female students, the first to open a coeducational medical school, and the first to officially recognize an LGBT student organization. UI's Iowa Writers Workshop is one of the most recognized and respected educational settings for writers in the world. The UI writing center falls under the department of rhetoric, and provides one-on-one instruction in writing and communication. Staff at the center can even help with compositions in Spanish and provide support to writers in the community through the public library. The writing center includes numerous Ph.D. candidates among its bevy of tutors. A Roman Catholic liberal arts college located within the Diocese of Scranton in Wilkes-Barre, Pennsylvania, King's College is the academic home of about 2,300 students enrolled in one of 40 majors, 11 concentrations, or three pre-professional programs. Originally, the school began as a place to educate the children of miners and mill workers. Today, it often receives recognition as a top performing college. The King’s College Writing Center consists of a director and 12 peer tutors who can coach students in all types of writing through one-on-one sessions. Tutors are available Sunday through Friday, and students do not need appointments to see them. Tutorials last 20-45 minutes and focus on developing a logical and well-expressed piece. The center can provide assistance for writing in French and Spanish upon request. Dr. Laurie Sterling, an accomplished academic, leads the writing center team. UNC is a public university of more than 228,000 students. First established in 1789, UNC now consists of 17 campuses throughout North Carolina. The UNC Chapel Hill campus is the flagship of the state's university system and educates nearly 30,000 of its undergraduate and graduate students. The school has 71 bachelor's, 107 master's, and 74 doctoral programs, and has a highly selective admission policy. UNC Chapel Hill's writing center has two locations, and tutors are drawn from across the university's extensive academic curricula. In addition to one-on-one appointments, the writing center provides online tutoring, workshops, and ESL support. Recent workshop topics included crafting an effective thesis statement, writing application essays, and polishing and proofreading. English language learners can enjoy a southern movie series as well as mini courses, writing groups, and workshops. The center employs five, full-time staff members as well as peer tutors. An evangelical Christian college located in Wheaton, Illinois, just outside Chicago, Wheaton College is the academic choice for almost 4,000 undergraduate and graduate students. The college began as the brainchild of evangelical abolitionists and, in its early days, served as a stop on the Underground Railroad. Recently, the school has enjoyed recognition for its quality academics and student performance in the academic community. Wheaton's writing center aims to "equip student writers to serve Christ and his kingdom through clear communication of their unique ideas." The center provides one-on-one 30-minute sessions, ESL services, and a hospitable space for student writers. ESL services focus on helping second language writers express their ideas clearly while retaining their own voices. In addition to the peer tutors, two TESOL-certified consultants and a director work in the center. Dr. Alison Gibson, a recognized expert on hospitable writing pedagogy, serves as the center's director. The University of Washington is a space-grant and sea-grant public institution founded in 1861. Currently, the institution is home to more than 46,000 students. The university's main campus is in Seattle, Washington. As the flagship university of the Washington state system, the University of Washington ranks high for its academic affairs. The school has received recognition as one of the top public research universities in the world. Students, teachers, and departments can take advantage of the University of Washington's extensive writing resources, including the The Odegaard Writing and Research Center and several discipline-based writing centers. Faculty members have access to resources for writing-integrated course design and teaching writing at a multilingual university. Students can receive help at the drop-in center, open writing circles, and a dissertation retreat. The University of Washington offers writing-related workshops on topics such as citation and plagiarism for English language learners. Located in Burlington, Vermont, the University of Vermont is a land-grant, space-grant, and sea-grant public research institution that serves as the flagship of Vermont's higher education system. Founded in 1791, the university currently enrolls more than 12,000 undergraduate, graduate, and medical students. Its emphasis on sustainability and rural studies has garnered the school much attention. UVM divides its writing centers between an undergraduate and a graduate writing center. Both offer free coaching and assistance to students who want to improve their writing skills. The writing center began in 1982, and today, the writing center serves 1,600 students per year. Sue Dinitz, who has taught writing at UVM since 1983, is the current director of the undergraduate writing center. The director of the graduate writing center is Nancy Welch, who has published extensively on public writing and social movement rhetoric. Pomona College is a private, nonsectarian, liberal arts school comprised of about 1,700 undergraduates and located in Claremont, California. Pomona consistently enjoys a top ranking as a national liberal arts college. A group of Congregationalists founded Pomona in 1887 as a west coast version of the elite liberal arts institutions of New England. Today, the school boasts students from all 50 states and more than 60 countries. Pomona's commitment to organics and sustainability has garnered much attention for the school in recent years. The writing program and writing center at Pomona help students improve their academic writing. Interested learners can schedule free, one-on-one appointments with peer tutors from multiple disciplines. The writing center, located in the Smith Campus Center, is open Sunday through Thursday. Consultations last 40 to 50 minutes for drop ins. Students with papers written in a foreign language, creative writing assignments, upper-level science papers, and thesis drafts should schedule sessions with tutors who can meet their specific needs. Located on a 200-acre campus in Indianapolis, Indiana, Marian University is a private, nonprofit, Roman Catholic college with about 3,500 students pursuing one of 41 majors at the undergraduate, graduate, and professional levels. Among the offered programs are nursing, education, and osteopathic medicine degrees. Marian's writing center offers a variety of services, including graduate student tutorials, online tutorials, Spanish language writing tutorials, and writing workshops. Recent workshop topics included digital storytelling and advocacy; APA: beyond the basics; and how to create a food and family podcast. The writing center employs three faculty and staff members as well as tutors and tutor coordinators. Tutors are available for email and in-person consultations. Members of the Indianapolis community can enjoy access to the writing center, such as high school students. The writing center is open every day except Saturday. 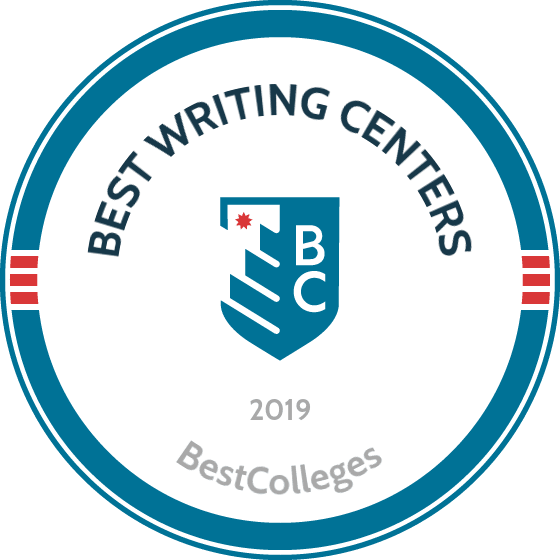 The top 25 colleges with the best writing centers are ranked based on several factors, including the ability to help graduate and undergraduate students, ESL services, and whether they offer multilingual assistance. The best writing centers also feature student-friendly hours and locations, and go beyond basic tutoring and editing support. Since peer-to-peer tutoring is the heart of the writing center concept, most schools feature a strong English or technical communication departments. The writing centers below employ faculty members who teach in well-ranked communication-related programs.